Athletic pubalgia, which was formerly known as sports hernia, is a fairly uncommon cause of hip and groin pain in athletes. It is most commonly seen in hockey and soccer due to the nature of the movements in these sports. It often follows an acute injury. For example, a 50-50 ball in soccer, where a player tries to cross a ball across the body but an opponent hitting the ball at the same time stops the leg, can cause this injury. Athletic pubalgia can also develop with repetitive stress over time. Treatment is initially nonsurgical. Rest or avoiding offending activities is usually tried first. 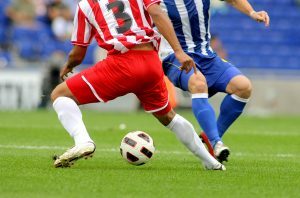 In high-level athletes, especially hockey and soccer, nonsurgical treatment can be difficult, as symptoms often return when the athletes get back into their sports. Occasionally surgery to address the tendon insertions of the abdominal and adductor muscles onto the pubic ramus is needed. Fortunately athletes who truly have athletic pubalgia often do well with surgical treatment. Return to sports can take 6-12 weeks, but if the diagnosis is made and treatment goes well, return to sports is likely.